So you’ve found a buyer and are on your way to selling your property. What now? You will require a legal document called a Vendors Statement Section 32, which we can prepare for you. Upon completion of this document we will forward it to your Agent and they will help you negotiate the terms of the Contract of Sale. When you have signed the Contract of Sale the Agent will send us a copy and we will begin the transaction process. This is a complex area of law that can lead to a stressful process without the right knowledge. That’s where conveyancing.today comes in. We assist you from start to finish, including advice to you, talking to the purchaser’s representative, preparing all relevant forms for State Revenue Office and Land Titles Office and most importantly attending to a successful settlement. We keep on top of all the required deadlines for you, so that you don’t have to worry about dates. We want to make sure that the sale of your property goes smoothly. So, if you are ready to get the process underway, we can get started online now! To complete the sale and avoid losing buyers, you’ll need to provide a Section 32 Vendor Statement quickly. To enable us to prepare a Vendor Statement for you correctly, we’ll need some information. All you need to do is fill out the form below then either scan and upload it or print and post the completed form to our office. Once you have uploaded your Contract we need to get to know you better and complete a Verification of Identity and complete a Client Authorisation. conveyancing.today can do this for you for free. Just stop by our office with 100 points of identification. Otherwise, you can go into any Australia Post outlet with the form below and your 100 points of identification and they will complete it for us for $39.00. This authorisation will allow us to sign documents on your behalf, submit them for lodgement and complete settlement including transferring funds directly to you. Please download and complete the form below to authorise us to act on your behalf. From 1 July 2017 where the contract price is $750,000 and above you will be required to obtain a Tax Clearance Certificate from the Australian Taxation Office. We will provide you with a link for you to complete. This must be done at least 14 days prior to settlement and the Certificate forwarded to our office. Failure to do so will result in 12.5% of the sale price be payable to the Australia Taxation Office at settlement. This amount may be refunded post settlement with the relevant application. Selling your property doesn’t have to be a complicated and stressful time. Our friendly and experienced staff can remove the stress and uncertainty out of selling your property by providing you with the assistance you need. 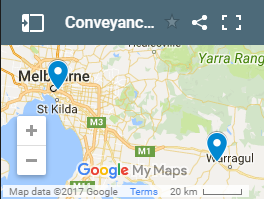 Our years of experience in property conveyancing Melbourne and throughout regional Victoria, as well as within the legal industry, combined with our thorough understanding of the steps involved in every property sale, allows us to streamline the process of transferring property ownership. This means that you’re able to complete most of the sales process from the comfort of your home or office, which saves you valuable time and money!